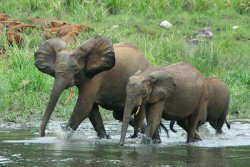 Elephants are not bothered by dynamite explosions, but nearby human activity prompts them to dramatically change their behavior, reports a Cornell study that used automated listening devices to monitor elephant behavior in Gabon. In 2006 the Gabon government granted permission to an energy company to explore for oil by cutting transects and detonating dynamite in Loango National Park. That action outraged environmentalists and led to a moratorium on oil prospecting until June 2007. In March 2007, researchers from Cornell's Elephant Listening Project (ELP) set up 10 automated recording units in the park. The resulting 27,000 hours of recordings -- obtained between March 2007 and February 2008 -- showed that blasting activity did not cause elephants to leave the area. However, the elephants closest to the human activity near the blasting shifted to a more nocturnal lifestyle, probably in an attempt to avoid the workers. "Elephants are sensitive to seismic vibrations, and we expected that the dynamite would disturb them [but it didn't]," said Peter Wrege, ELP director and lead author of a paper that was posted online July 27 in the journal Conservation Biology. An automated recording unit in Loango National Park. After comparing the recordings of dynamite explosions to thunder, Wrege and colleagues reported that the two sounds may seem similar to elephants and "not something they weren't used to hearing," Wrege said. However, the team reported that the recordings suggest that the sounds of chainsaws felling trees, trucks and workers prompted the elephants to change their behavior to a nighttime routine. ELP's decision to monitor the elephants in collaboration with the World Conservation Society may have put some pressure on the government and energy company to develop strict operating procedures before prospecting began anew in June 2007, Wrege said. The new protocols required the company to avoid nighttime activities and to limit the size of new transects and the size of trees cut, Wrege added. The recordings also picked up gunshots in the forest, which have led to patrols through the park to deter poachers, Wrege said. Resource extraction in developing countries is inevitable, said Wrege, and some industries appear willing to listen to environmental and wildlife concerns, "but often we do not know what the problems are. "By listening to the natural environment we can reveal hidden but otherwise important relationships between wildlife and humans," said Wrege. "Acoustic technology gives us one more tool in the toolbox that lets us find out things we wouldn't find out in some other way."